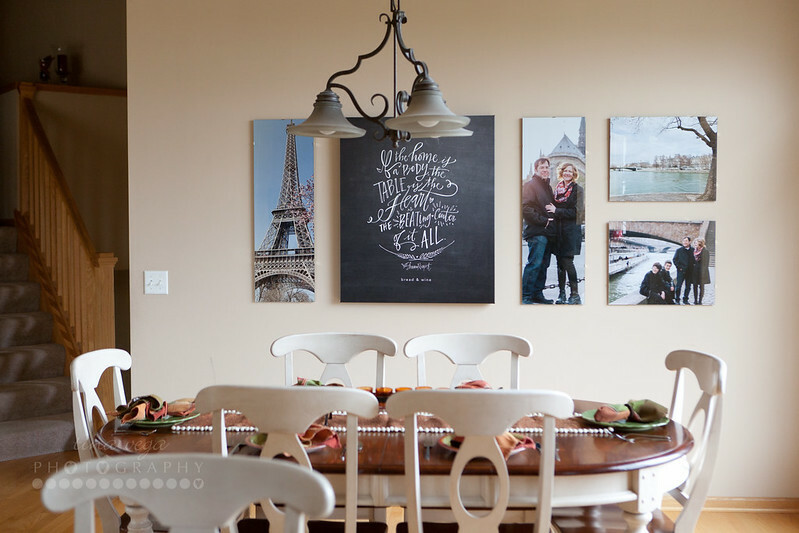 Shortly after the first of the year, I ordered the canvas above from Lindsay Letters with the intention of creating a wall of art in our dining room. The canvas sat for months in its packaging, lying in wait for a new dining room table I’d planned on ordering by fall. But thanks to a lovely new concrete driveway apron, the table didn’t happen. I decided to bite the bullet and move forward with the wall anyway. We spend a lot of time around the table – family meals, IF:Table, and other social gatherings. 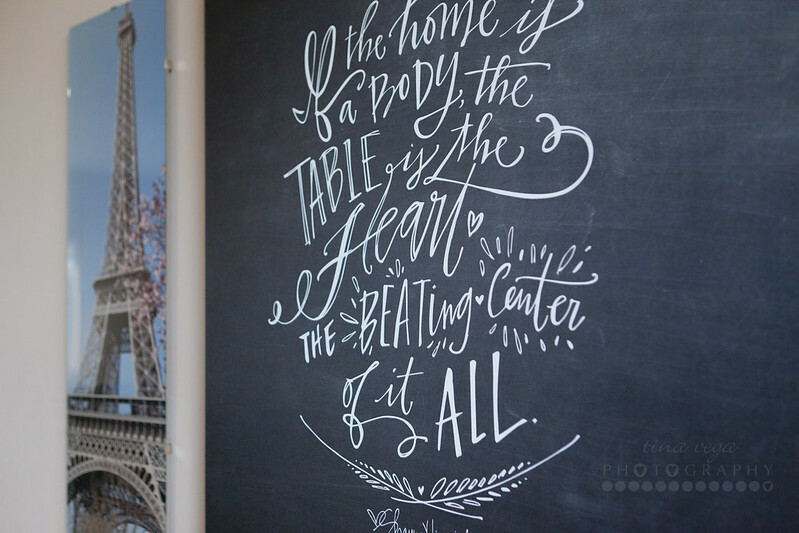 I absolutely adore this quote from Bread & Wine and thought it the perfect piece to work around. I wanted to make better use of the space, creating a photo “mural” for visual impact. The canvas itself is 30×36 – which sounds large until you see it up on a very large wall! The images are a mix of my photos and those captured by Gonçalo (check out Flytographer for more information) from our family trip to Paris last March. I used glass clip frames from Quadro Frames in 12×36 and 16×20 sizes to showcase the images and am so happy with the results. The borderless frames work well in the open space and don’t compete for attention with other artwork in the area. 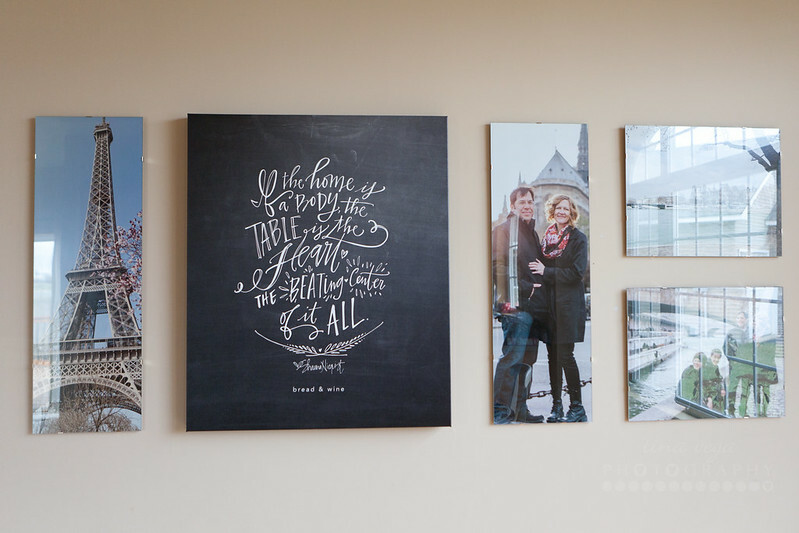 Our living room contains a mix of images printed on wood and canvas, by way of PhotoBarn. The images, a collection of moments from everyday life: date night at Applebees, raspberry picking in our garden, family trip to Ely, Lorenzo in a St. Cloud hotel room, and Emilio practicing his serve.